Looking for more information on Betty? Check out these websites for more information! These websites below offer some sort of information on Betty White. 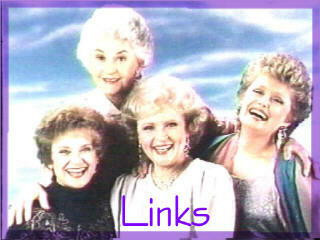 All of these websites are really great websites to gather even more information about Betty. Be sure to check them all out. Totally dedicated to one of "The Golden Girls" spin offs -- Empty Nest. Has been up and running for 5 years, and has THE most information you can find about this classic sitcom on the web! A great Golden Girls' website with an patriotic twist. Includes information, actress biographies, several photo galleries, and much more. Arlene Francis' official website. An awesome dedication to the late Arlene Francis. Offers a total insight to her life on screen and off. A radical look at 'The Golden Girls' british style. Included behind the scenes information, Cast/Crew biographies, several photo galleries, message board, and much more! A total tribute to Bea Arthur. Includes Bea's biography, photo galleries, animal rights, stage and onscreen information, and much more. Where love IS all around. Totally dedicated to the 1971-1977 hit show "The Mary Tyler Moore Show". Learn about the show, actors/actresses, character profiles. A total dedication to Mary and the gang. Betty White Online offers AWESOME information about our sweetheart! Filled with great information, clear and crisp pictures. A GREAT site to check out. Totally dedicated to the sassy and salsy Rue McClanahan. Included a complete biography, information on all of Rue's career choices, personal information, and much more! Total trip into Bea's professional and private life. Filled with pictures, video clips, sound clips, fan's stories about meeting Bea, interesting facts about her personal life, and much more. Don't miss out!